Although solid-state disks (SSD) are lightning fast compared to poky old hard drives, they’re also far more expensive, which is why Mac users have had to with more restrictive internal storage than in years past. 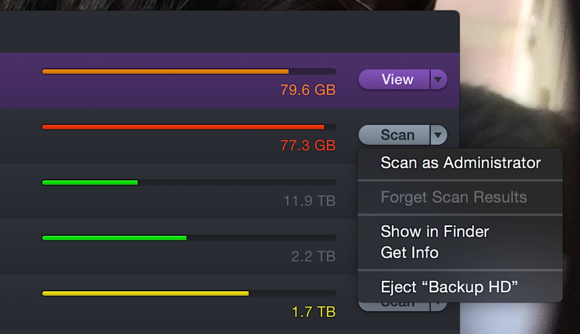 It’s a tradeoff: Speedier disk access, but less room for files. One way to maximize this smaller capacity is to carefully monitor which files—especially big ones—take up that space and then terminate them with extreme prejudice. DaisyDisk 4 is a utility app made expressly for this purpose, and it’s as attractive as it is handy. In terms of functionality, DaisyDisk 4 hasn’t changed much from previous versions. Launching the application presents a list of all mounted volumes, and I do mean all: In addition to local storage, the software can root out folders and files on network-attached storage or cloud services mounted on the desktop like those offered by ExpanDrive and Bitcasa. DaisyDisk 4 scans any of your mounted volumes—including network-attached storage—faster than previous versions. Click the Scan button next to the drive you want to calculate; DaisyDisk can also run concurrent scans by initiating multiple drives at once. In addition to volumes, there’s an option at lower left to scan a specific folder, which can then be marked a favorite so it always shows up alongside your disks. By default, scans are done in Normal mode, hiding files—such as other user folders—you don’t have sufficient access privileges to. Tucked under the downward triangle is an option to scan in Administrator mode instead, which causes that drive to be highlighted in purple. This feature isn’t available on the Mac App Store version due to sandboxing limitations, but those customers can download the web edition and unlock full functionality free of charge. Appearance-wise, the traditional grey title bar along the top has been consolidated into the rest of the window. The darker, slightly flatter user interface is now more in line with the modern OS X look and feel, while color-coded fuel gauges show at a quick glance which disks are in need of a little TLC. A key difference between the retail and Mac App Store versions of DaisyDisk 4 is the ability to scan in Administrator mode for complete access to a volume. Perhaps the first thing you’ll notice about DaisyDisk 4 is the dramatic increase in performance. Scans now happen in seconds rather than minutes, depending upon the type of media and processor speed. Naturally, SSD storage and quad-core CPUs provide best results, with network drives falling at the slower end of the spectrum, since they depend more on internet bandwidth. It took about a minute and 20 seconds to scan the 500GB flash storage inside my mid-2012 MacBook Pro with Retina Display—not bad, considering it’s almost 80 percent full right now. A Drobo mini containing four 1TB 7200 rpm notebook hard drives added only a few seconds, completing the initial scan in a minute and 31 seconds flat. Folders or files can be viewed in graph or list view, making it easy to see which ones are consuming the most space on your drive. 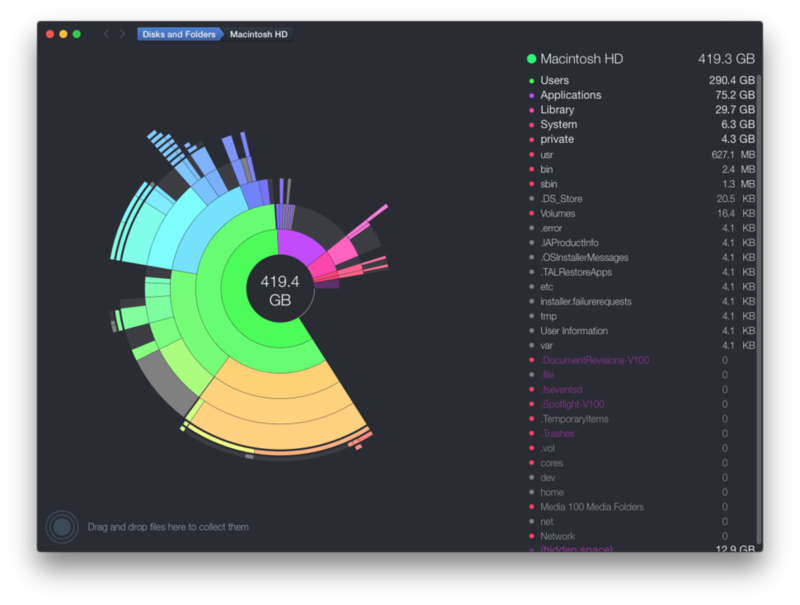 After scanning, DaisyDisk displays drive contents in two ways: A vibrant, colorful “exploded” graph showing where large files are lurking, and a list of folders and files, sorted from largest to smallest. After identifying space-hogging content—a task aided by QuickLook previews using the Space bar—drag-and-drop unwanted folders or files to the Collector at the bottom of the window, where they can be rejected or deleted in a few clicks. 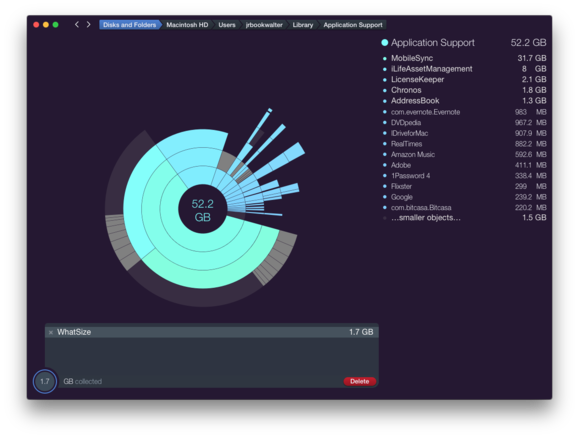 For only ten bucks, DaisyDisk is a simple, convenient utility for every Mac owner, and it gets the job done well for less technically-inclined users. I’m still partial to WhatSize ($15), which trades the lower price and good looks for a more detailed, robust feature set including duplicate file detection and one-click cache cleaning, but quite happy to have both in my arsenal. DaisyDisk 4’s Collector is a holding area for potentially unwanted files, which can be rejected to deleted in just a click. DaisyDisk 4 may not look like a significant improvement over previous versions, but the adoption of a new OS X aesthetic and big performance gains make it a worthwhile update just the same.